Welcome to the Phil-Lok positive-locking fastener web site. This site has been established to promote the "The Phil-Lok positive-locking fastener", to encourage the practice of "positive-locking fasteners" and to demonstrate the advantages of "positive-locking" over other traditional vibration resistant fastener practices and products available on the market today. A vibration resistant fastener uses increased frictional forces to prevent nut loosening where a vibration proof (positive-locking) fastener actually uses a physical stop or barrier to prevent nut loosening. In the case of the Phil-Lok fastener a simple yet unique patented coupling mechanism acts as the physical stop whereby the nut is rotationally fixed relative to the bolt to inhibit rotation of the nut. Additionally, our fastener can be used to reduce warranty costs on products, equipment and machinery, increase up time on the manufacturing floor and is far a safer alternative to vibration resistant type fasteners. This fastener can be made to most specs. 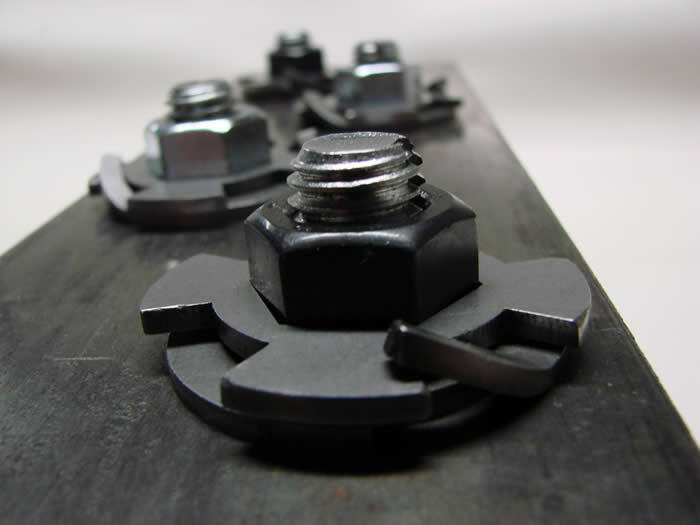 This fastener already meets MIL specs that call for both "locking" and "slotting". Also, this fastener has been designed to be price competitive with other fastener locking devices, particularly lock washers, by using the same low cost high volume manufacturing (stamping) processes used to make lock washers.